For those living in South Florida, sea level rise is a very real problem that’s impacting coastal areas right now, and is expected to worsen over the next decade. While most discussions on sea level rise in Florida focus on highly populated coastal cities such as Miami and Tampa, sea level rise is also having significant impacts on habitats in the Florida Coastal Everglades. In a recent study at the Florida Coastal Everglades Long Term Ecological Research Site (FCE-LTER), researchers found that increasing freshwater inputs has a significant impact on reducing the negative effects of sea level rise on the Everglades. Not only is the total amount of freshwater input important, but the timing of freshwater inputs is also critical for reducing the effects of sea level rise on the Everglades. A waterway in the Florida Coastal Everglades. As the third largest national park in the lower 48 states, the Florida Coastal Everglades receives over one million visitors each year. But because this fragile ecosystem lies below sea level, it’s susceptible to the negative and irreversible impacts of sea level rise. Rising seas threaten the Everglades with coastal erosion, changing flora and fauna, and the release of many tons of carbon as old growth mangroves and wetland soils become inundated by the sea. To counter future saltwater inundation, efforts are underway to restore natural freshwater flows and water levels in the Florida Coastal Everglades to maintain flood protection and water supplies for the residents of South Florida while sustaining the Everglades ecosystem. Natural freshwater inputs to the Everglades come from direct rainfall and from inflows of regional rainfall stored upstream in reservoirs that manage freshwater flows into to the Everglades. Researchers with the FCE-LTER site synthesized 16 years of hydrologic data in the Shark River Slough portion of Everglades National Park to understand how long-term hydrologic parameters (water levels, salinity, and nutrient concentrations) respond to changes in freshwater inputs, sea level rise, and climate variation (rainfall and evapotranspiration) in the Everglades. The researchers aim to use this information to inform conservation efforts on how to manage freshwater flows through the region to make the Everglades more climate-resilient. 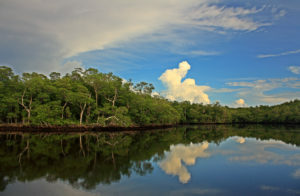 According to a recently published FCE study, the height difference between freshwater marsh level and sea level (fresh-to-marine head difference, FMHD) was the single most important factor affecting water connectivity and transport of salinity and nutrients in the coastal Everglades. A greater difference in height between freshwater marsh level and sea level can reduce the negative impacts from sea level rise. During Florida’s dry season (January to June) when there is very little freshwater inflow to the Everglades and the height difference between freshwater marsh level and sea level is small, the Everglades experienced the greatest impacts of sea level rise, with greater concentrations and residence time of salinity and phosphorus. These changes in salinity and nutrient concentration can cause shifts in the coastal wetland community composition and alter the ecosystem function of the Everglades. For South Florida, the coastal Everglades are the first line of defense against sea level rise. As of today, the current plan to restore the Everglades natural freshwater flows may not be sufficient to push back sea level rise. Everglades restoration efforts, which focus mainly on increasing upstream freshwater inputs, also need to consider timing of freshwater inputs in order to maintain a high FMHD and reduce excess salinity and nutrient levels in the Everglades, reducing the impacts of sea level rise throughout this fragile and vitally important ecosystem.